Pilates and Power Plate for seniors in the Wayland, MA area. From 9 to 90; anyone can benefit from Pilates! I’ve been a Stott trained Pilates instructor for 20 years and I’m eternally grateful for this training that has opened up a new world for both myself and my clients. This core focused modality has been the jumping off point for my work of the last 20 years. Pilates is as simple as making a connection with your core and challenging that connection with the movement of the arms and legs through the different exercises. I’ve always said that when it comes to body movement, you are only limited by your imagination. I integrate Pilates into most everything that I have people do. It improves balance, posture, flexibility and range of motion, strength and tone and alleviates pain. Developed by Joseph Pilates a hundred years ago as physical therapy for wounded World War I soldiers; it’s been updated for current knowledge of anatomy and physiology. Whole body vibration for building stronger, denser bones. I found out about Power Plate whole body vibration 10 years ago when a French client told me about it. I bought my first Power Plate shortly afterwards and have been off and running since! I can’t say enough about this technology that was developed by a Russian for the cosmonauts when they came back from space to regain bone and muscle mass. Everyone can benefit from the Power Plate. I use it to reverse osteoporosis, alleviate pain, increase strength and flexibility, manage neuromuscular conditions, etc. This is the best thing to happen to fitness and rehab in decades! Accelerated training means that you can accomplish a workout in a fraction of the time without pain! Come on in and try a complimentary session on this amazing machine! 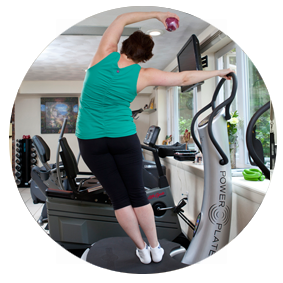 Read more about Power Plate! From 9 to 90; change your life for the better! 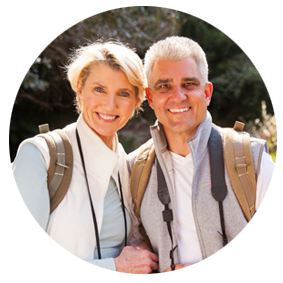 From weight loss, home and travel programs, strategies for improved health and wellbeing and a referral source for related services including, but not limited to: acupuncture, physicians, alternative practitioners, orthotics, psychologists and fitness equipment providers. I have a wide network of “masters” in their fields. I don’t refer to anyone whose services I haven’t tried myself! FDA approved, this therapy is truly miraculous! Light energy stimulates the release of nitric oxide from hemoglobin into the blood stream. When nitric oxide is released from hemoglobin, it enters the muscle cells in the walls of the blood vessels. The muscle cells relax as the blood vessel diameter enlarges, allowing more blood to flow through the vessels. The benefits of increased nitric oxide are many. 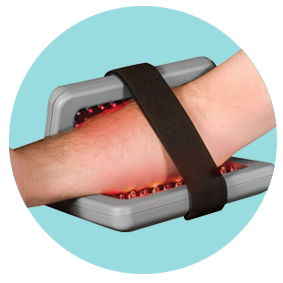 Increased circulation, reduced inflammation, tissue regeneration (healing), pain reduction and more! For diabetics this therapy is truly amazing! Studies have shown significant improvement in diabetic peripheral neuropathy (DPN). Significant pain reduction and improved sensation were routinely observed. Reduce or eliminate your pain medication! This therapy can also be used pre or post exercise to better warm up the muscles to optimize athletic performance and to improve post exercise recovery of strength and function. Relax while the light therapy improves your health and well being. My clients have had amazing results with this therapy! I have so much fun working out with Deb that I forget that I’m exercising. The setting of Pilates Works is unusual: Of course Deb has the usual equipment, but she also has equipment not commonly found in commercial gyms. Her studio is immaculate and has a beautiful woodland view. Working one-on-one with Deb in the privacy of her home studio helped me build confidence as well as strength, better balance, and improved posture. Do not fear exercise: Deb has worked with me before and after spine surgery and helped me recover from a shattered ankle. While she pushes me to work harder, she is careful about avoiding injury.